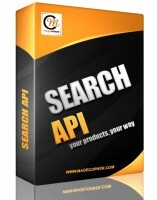 What is the Magento Search API? The Magento Search extension API is a Magento extension that allows Magento Store owners to provide a SOAP Service for other websites/apps to do product search with just a few lines of code and get a list of products from within your magento store. This extension uses the default search functionality so results should be similar. What does this Search extension do? The Magento Search API receives a search keyword(s) and returns a specified number of products that match the search keyword allowing you to provide quick access for clients/partner websites/apps to the products you offer. This extension is set to return the product details: name, image and link and can be easily modified to return additional product data. The Magento Search API extension is naturally integrated with Magento and therefore all search related statistics are preserved and available in the Magento admin. Where can I use this search extension? It is cross platform – any platform that can use SOAP can use the API. It is super easy, you make 2 calls, and voila – you get keyword related Magento products list. Magento comes with a native SOAP Server and the Magento Search API uses all the Magento native calls so all Major programming languages that can do SOAP calls(PHP, JAVA, C#, C++, …), can use and integrate the Magento Search API in any website/application. The extension has been tested on 1.6.0, 1.6.1, 1.6.2, 1.7.0, 1.8, 1.8.1. Yes, you can visit us at our website: www.magecorner.com to get help. How does the Search API extension work? You make a soap call to your Magento server and retrieve the results. The use a simple for loop to parse through and present the results as needed.